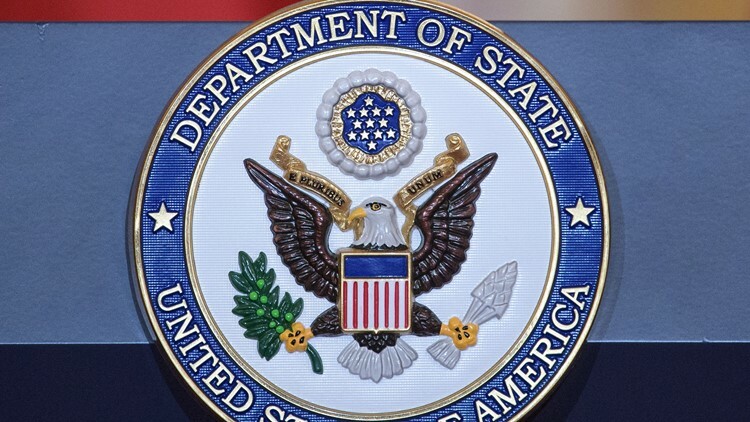 A May 11, 2018 photo shows the seal of the US State Department at the State Department in Washington, DC. Michael White, the first American known to be detained since President Trump took office, was convicted on charges that included insulting Iran's supreme leader. DUBAI, United Arab Emirates — A Washington-based lawyer says a U.S. Navy veteran held in Iran, the first American known to be detained since President Donald Trump took office, has been sentenced to 10 years in prison. Mark Zaid told The Associated Press on Saturday that Michael White was convicted on charges of insulting Iran's supreme leader and posting private information. Zaid says he learned of the sentence from the State Department, which in turn learned of it from the Swiss government, which looks over American interests in Iran. Iranian state media have not reported the sentence, first reported by The New York Times. White, of Imperial Beach, California, went to Iran to see a girlfriend he met online and had booked a July 27 flight back home. He never returned.